Hank Williams and Audrey Williams used to be married to each other. They had a child and were destined to live happily ever after… for only a short amount of time though. His chronic pain and alcohol abuse, her stubbornness and desire to sing beside her husband heralds the beginning of their troubled marriage. But even that, and a seemingly doomed to failure marriage with too much distraction did not prevent Hank Williams to write successful country songs, and one of them, “I Saw the Light”. I can say without exaggerating that Hank Williams is the father of contemporary country music, whose life was cut short at the age of 29. And now, you can imagine how much responsibility falls on Tom Hiddleston‘s shoulders when it comes to portray a beloved musical figure such as Hank Williams. Moreover, Elizabeth Olsen did not have an easy ride either to portray a difficult character such as Audrey Williams, who had her own issues to fight against. This interview would have stayed on the request paper, and most likely, forgotten if not for the efforts of one person who departed this world at Christmas time in 2015 – Don Marren. This is why I would like to dedicate this interview to Don Marren as it’s the only known way for me to express my deepest gratitude for making this interview happen. Thank you, Don! May Your Soul Rest in Peace. MOVIEMOVESME: Your characters are challenging, so what is your process as an actor to do justice to these characters? Tom Hiddleston: I felt a duty to play him honestly, I felt a responsibility to commit to his truth. I knew I had to put myself in the paces he put himself through and get onto the skin of who he was and who he truly is be it flaws or compassion and try to feel the things he felt because he had a self-destructive headlong life. That was all I had to do, try to commit myself to his experience. Elizabeth Olsen: When you start doing research on Audrey, you try to find anything that’s quoted, or listen to her voice, her own music. She was a notoriously disliked person and that’s sad. She has a daughter that’s still alive and she’s the person who speaks highly of her and I think all she wanted was us to treat her with respect because she knows her mother does not have a great reputation. So you try to have compassion and empathy for someone in her situation who had goals and was driven. She was a great businesswoman while he didn’t have a business mind at all, was an alcoholic and womanizer. Elizabeth Olsen as Audrey Williams. Photo by Sam Emerson, Courtesy of Sony Pictures Classics. Tom Hiddleston: I knew I couldn’t ever replicate his voice exactly because the voice is a part of my own body so it just resonates differently. But I knew that I had to try and get close to it. To do that in two ways, one was to simply sing it with the sincerity he did and charisma. I found recordings under his pseudonym Luke the drifter and it was really profoundly useful. They were poetic recitations set to musical accompaniments where he wasn’t really singing but kinda preaching. Tom Hiddleston: I trained with a musician called Rodney Crown, who is based out of Tennessee. He invited me to live with him for 5 weeks before we started shooting. We’d wake up in the morning, make porridge, have a cup of coffee and we’d sing all day. It’s interesting because voice is something that’s not consistent. Some days it was dusty and croaky and other days we hit our stride pretty early, sort of a purple patch. On days like that he’d be like, “We gotta eat now ad go to bed!” It was a pleasure and it was challenging because I was trying in a very short time to get close to Hank who had 25 years to practice. But it was the most joyful challenge; you cannot sing these songs and not get enormous pleasure from it. Elizabeth Olsen: When I think of singing, the actual act and why it is so powerful, I think it’s something it does that you cannot speak about. It’s like another form of communication and everyone has a different relationship to whichever singer, whatever sound that they somehow are moved by. To me it’s a magical thing, if you can penetrate someone through sound that’s an entirely unknown thing to me. Tom Hiddleston: I think it is the most direct emotional medium. To sing is more naked, more vulnerable, more raw. A novelist can hide by his anonymity in a way and can hide by his characters, even musicians can hide behind the instruments but if you sing, it’s so raw and it has to be so perfect. It will not travel unless it is deeply felt and committed to, and I learned that very deeply. A history teacher once told me when I was in school, a quote by an essayist called Walter, “All art aspires to be conditioned in music.” I always took that to mean music is the most directly emotional art form, like an arrow to your heart. People sing when the language of the spoken word is no longer sufficient to express the depth of what they’re feeling. MOVIEMOVESME: What was the main characteristic you drew from your characters to portray them on screen? Elizabeth Olsen: There’s isn’t just one thing I’d pick specifically because it’s you’re not portraying someone in a one dimensional way. What I wanted out of it was I didn’t want people to just think she was stubborn and manipulative, I wanted her to have a heart and pain and she tried really hard. It was a struggle and it lost, that’s what I cared about because there were so many negative things about her and I wanted to change that. Tom Hiddleston: For me it was the tension between something I felt he bought so much joy to so many people from so much pain. He had generosity and spirit but it cost him. I wanted to show that the more he gave the more he suffered and that seemed very complex and interesting. 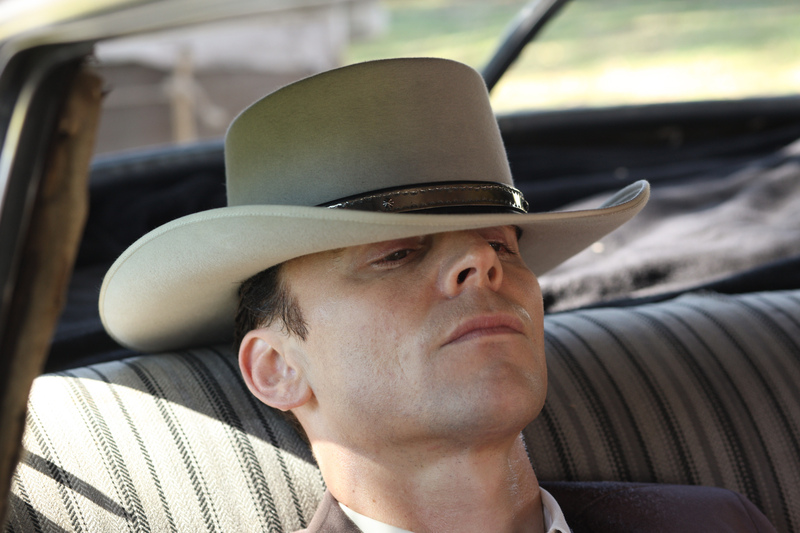 Tom Hiddleston as Hank Williams. Photo by Sam Emerson, Courtesy of Sony Pictures Classics. MOVIEMOVESME: Do you have any favorite Hank Williams song? Tom Hiddleston: There are so many; there are ones that make my toes tap and ones that are so mournful and sad. I love “Long gone lonesome blues” because I like the yodel in it. MOVIEMOVESME: There’s nothing more authentic than catching country music because it’s uniquely America. Your thoughts being American and Non-American? Elizabeth Olsen: I think something Mark, Tom and I talked about with the music and film itself is sincerity. There is something incredibly sincere and direct honest about country music and that showed in the film and the script too. Tom Hiddleston: The thing I’ve been fascinated by authentic American, the foreign territory of authentic American experience has been incredibly exotic as a European. I think that’s how somehow culturally America is born; they sing the same song that’s deeply felt and it’s something that can be shared and it has become really embedded in the culture. MOVIEMOVESME: Did either of you had contact with their family and talked to them before? Tom, did you have any concern regarding a Brit playing someone who’s from the south? Tom Hiddleston: Whichever side of the Atlantic you’re from, it doesn’t matter; Meryl Streep can play Margaret Thatcher, Daniel Day Lewis has done it but whenever someone from the other side does it, they’re like, “Oh my God!” It’s a conversation that always gets talked about. My personal belief is if the actor has sufficient commitment to play the role with respect, it doesn’t matter. I knew I was going to give this everything I had; I felt the weight of the responsibility to present his legacy. But part of being an actor is that I’ve always been drawn to foreign territory and I like portraying characters from where I’m not from. Last time I checked I wasn’t born in Asgard either! MOVIEMOVESME: The film is set in a different time and place, can you talk about the approach, the performance you have to deliver? Elizabeth Olsen: Well, there are a lot of technical things you need to do first, so you work on the dialect of the place, dialect of the time. Basically, work on the technical stuff. Tom Hiddleston: It all comes from the sound. I heard a lot of recordings of Hank and I knew I had to be faithful to the 40s South as opposed to the contemporary south. I guess that’s what makes it sound like back in the day. It was interesting Mark Abraham is so literate at cinema that he directed films he was particularly inspired by too. So the collective psyche we were fed into, that was the style.